Will was born in Chicago on August 29, 1940, the first child of Lois Nadine Henderson Miller and Willard Marshall Miller, Sr. He attended Chicago public schools and enlisted in the Army on his 17th birthday. He joined the U.S. Army Security Agency, becoming a signal analyst with a top secret codeword security clearance, carrying out electronic surveillance missions directed at the Soviet, East German and Czechoslovakian forces in eastern Europe from 1958 – 1961. He earned his GED while in the Army and passed an exam exempting him from his freshman year of college. At the University of Illinois, he received his B.A. in 1966, M.A. in 1968, and Ph.D. in 1969 all in the field of philosophy. Will began his career at UVM in 1969, teaching courses in the philosophy of education, Marxism, American philosophy, radical ecology, and utopian societies, among other topics. Over his 35 year teaching career, Will taught thousands of students in his classes, at teach-ins and speakouts, and as a guest lecturer. He gave talks for the state humanities council in the '80s, and spoke at numerous demonstrations and rallies. Will's academic credentials included membership in United Academics, a group affiliated with the American Assoc. of University Professors and the American Federation of Teachers. He was for many years an active member of the John Dewey Society, and a member of the Society for the Philosophical Study of Marxism, and the Radical Philosophy Association. As an anti-war activist, Will dedicated his life to the struggle for peace and social justice. He fought tirelessly for academic and political freedom, rights of the working class and all inhabitants of the earth who suffer from economic inequities and prejudices. He was faculty advisor to many of the radical student organizations at UVM including the Radical Student Union, Union of Concerned Students, The Gadfly alternative student newspaper, and SPARC (Student Political Awareness and Responsibility Collective). He worked with each faculty and staff union organizing endeavor and initiated and participated in numerous organizations in Vermont, fighting for the rights of the oppressed. He spoke at community meetings about veterans' issues, the environment, imperialism, capitalism and the interconnectedness of issues. He was tireless in his activism and there were few progressive rallies or events that didn't include his incisive addresses which were passionate and articulate. 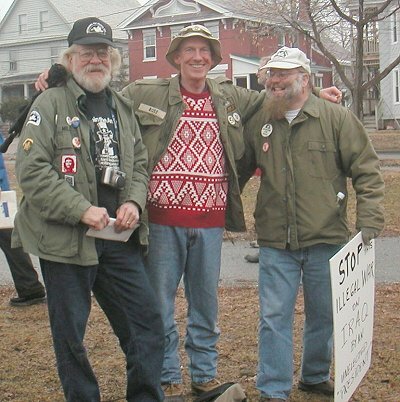 Along with his community service to the University, Will worked as an activist in such organizations as the Vermont Veterans for Peace, Burlington Area Draft and Military Counseling, the Green Mountain Fund for Popular Struggle, the Vermont Cuba Committee, Haymarket People's Fund, and the Committee in Solidarity with the People of El Salvador. We all mourn the loss of this sweet, gentle, generous, compassionate human being with a big heart and boundless faith in the goodness of people. He will be greatly missed. He left us a legacy of inspiration -- not to be discouraged but to keep fighting the atrocious ideologies related to war. We encourage visiting www.willmiller.org to read and write about how Will's life and words have influenced others. A memorial service will be held at 2 pm on April 24, 2005 in the Unitarian Universalist Church in Burlington. Tax-deductible donations can be made to the Will Miller Social Justice Lecture Series, established in his honor. Checks can be sent to Ann Lipsitt, 10 Machia Hill Road, Westford, VT 05494, designated for the Lecture Fund.